Alan sent in the above photo of Acamar at her slip in Charboneau on the Snake River. The following is from Alan's post on the Sailnet Dolphin Email list in February, 2006. It is great to connect with fellow Dolphin owners. I own Yankee Dolphin 139, Acamar. She was called Yankee III when I purchased her in Marina Del Rey in 1974 (Webmaster Note: see below for more on Yankee III). I moved her to Redondo Beach shortly after purchasing her and kept her there on E-Dock until 1991. She now resides on the Snake River in Southeastern Washington at Charboneau Park behind Ice Harbor Dam. It is hard to believe now, but if my memory serves me, at one time there were about 21 dolphins berthed in Redondo Beach. Like Acamar, most have found homes elsewhere. Work has taken me far away from Southern California, but I miss the great sailing down there. While there, Acamar often cruised to Catalina and would often anchor at a little cove near the West End. She made it out to Santa Barbara Island and the Channel Islands a few times, and once went as far as Cuyler Harbor at San Miguel. 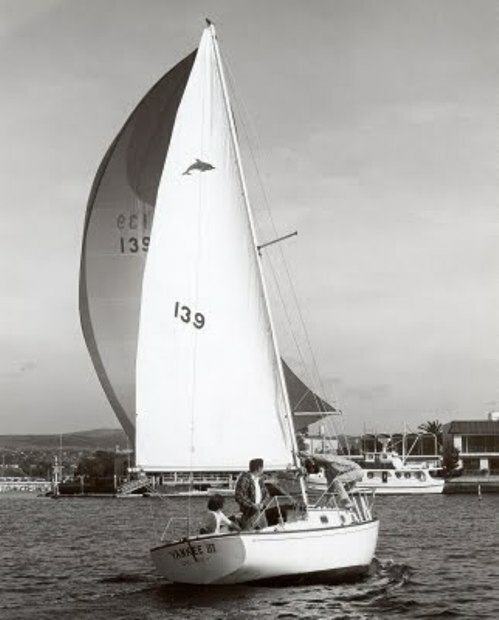 The boat was originally owned by the owner of Yankee Yachts and used by him to promote the class. I have some old Pacific Skipper sailing magazines with advertisements for the dolphin in which one can clearly see the 139 sail number. There were also articles and letters in, Pacific Skipper, back in the 70s about someone who sailed a dolphin to Tahiti and back from Santa Barbara and details of some of the modifications that the owner made to take her offshore. I believe I still have those lying around and will share the information if anyone is interested. I recently got Acamar back into the water after a couple of years out for extensive blister repair. Acamar is the only Dolphin I know of that has required this. It could be the fresh water, or due to the fact I didn't haul her out for about 10 years due to lack of facilities in this area; although I had noticed a few dime size blisters, which I ignored, when I used to haul her out every other year in Redondo. (I finally bought a Triad Trailer for her so I could haul her out.) While she was out I replaced all the thru hull fittings with bronze ball valves. We also made new handrails (I was unable to locate any ready made that were as long as required). We also replaced the teak half rounds that run along the top of the cabin sides, and made new hatch boards. We cleaned up all the teak and made new cabin cushions as well. The hull still looks pretty good with a rubbing out and waxing. It is my observation that dolphin owners tend to be an independent lot, and even in the early days, most were cruisers and few were raced. I always thought that given her rating she would do well in PHRF, and that has been born out in accounts I have read and also I raced her a few years up here on the Snake River and she did quite well. Her best time from Catalina for the 24 NM to Redondo was 4hr 10min. Her worst time was about 13 hours. She also once made the 18 NM from Little Scorpion on Santa Cruz Is. to Ventura harbor in exactly 3 hours. She was keeping company with (actually slightly overtaking) a Hans Christian 43, a Garden style 41 foot ketch, and another boat about that size--maybe a Islander Freeport 41. It was a beam reach and we carried a 150 and a full main. I don't remember the wind speed at the time, but in order to enter the harbor we changed down to a working jib and a single reef and hit 8.5 knots surfing into the marina. Acamar came with 8 winches--four on the fiberglass coamings (for jib and spinnaker sheets), two on the cabin top for the spinnaker halyard and the spinnaker staysail halyard, and the two mast halyard winches. Her traveler is also a little wider than I have seen on other dolphins. She has a stainless genoa track from her stern to up near her middle cabin window. She also has no wood under her side decks or forward deck--only glass. I think maybe Yankee Yachts wanted a fast one to race. She has a bronze plate in her overhead cabin beam attesting to the fact she sailed in a 1969 Marina Del Rey to San Diego Race. I was told by the previous owner that she won some silver in that race, but I was never able to confirm it. As long as I am reminiscing, I remember one time tacking up toward the yacht club in Redondo Harbor with the windows half in the water. I don't remember what we were carrying for sail, but we had gone out during a lull in the winter storms and got caught with no room or time to reef. There were a couple of 35 foot auxiliaries that were trying to motor into the wind and we passed them despite having to tack back and forth. Clearly mine has been a long-time love affair. I sometimes think about getting a bigger boat, but I am unable to part with the dolphin. I still enjoy just admiring her lines. Olin Stephens put beautiful curves into her everywhere. I am looking forward to hearing from other Dolphin owners. Here is an ad from Pacific Dolphin that uses in the ad (June 1977) a picture of a Yankee Dolphin. The hull number in the (center) picture is #139 -- my boat. It was originally called Yankee III and I renamed it Acamar. For the record Acamar is a 1969 boat, not a 1970 as listed. She even has a plaque stating she participated in the 1969 Marina Del Rey to San Diego Race. "I seldom used the engine in those days and sometimes didn't bother to carry one. I had a couple of long oars and originally installed oar locks, but later I discovered I could just row her by leveraging the oars off the cockpit winches"
I used to row Acamar. There were times when I even cruised without an outboard. I installed wood blocks outside the cockpit to hold the sockets. At some point the wood split and I discovered it was just as easy to leverage against the Genoa winch. At first I had a loop of rope to hold the oar next to the winch, but later discovered by twisting the oar on the return stroke it would stay in position. The oars are 9 feet long with leathers to protect the wood. I would stand in the cockpit facing forward with the tiller between my legs. 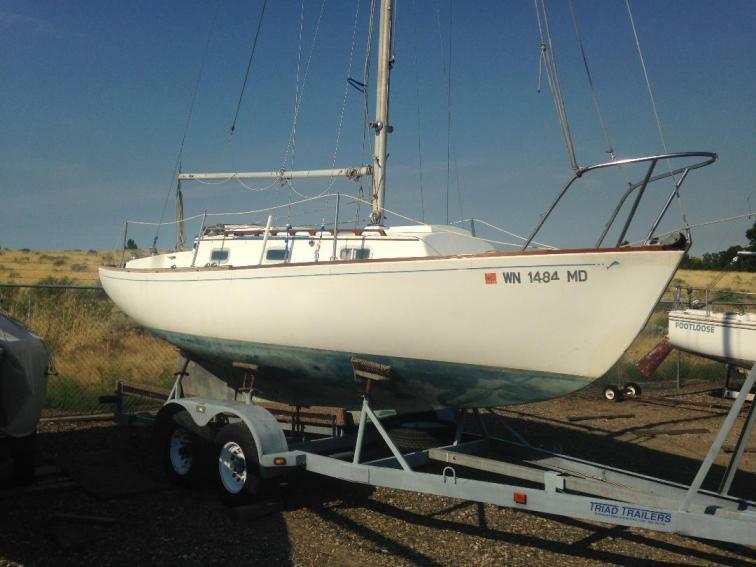 It wasn’t very fast — maybe one, or one and a half knots, but it got me into the anchorage a few times after the wind died, or to just move the boat short distances when I didn’t want to bother with the outboard or sails in light wind conditions. I read what Larry Pardey wrote about using a sculling oar and it sounded like it would be a lot more effective, but if I remember correctly, it requires a specially shape oar and I never tried it. April 22, 2012. 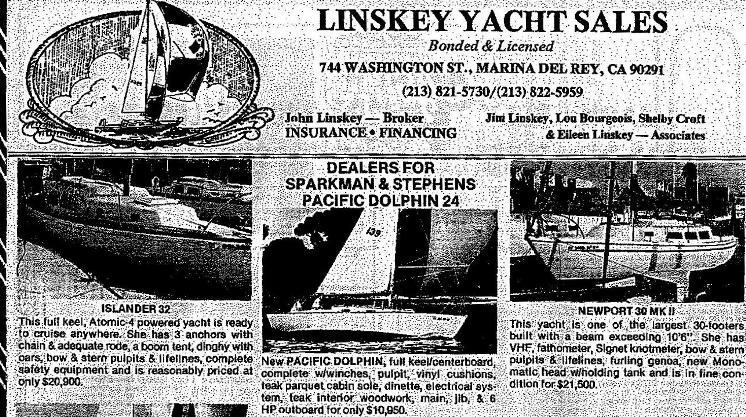 On a Sunday morning cruise through the Internet your webmaster checked out the Sparkman and Stephens Blog http://sparkmanstephens.blogspot.com and naturally, used their search button to find out what was posted there about the Dolphin 24 http://sparkmanstephens.blogspot.com/2011/06/dolphin-24-design-1497.html. Posted there, in addition to design plans, and pictures of Hull #1, was a picture of Yankee III. November 24, 2018. Anthony Ennis, (Enough, Lunn #217) sent in a copy of an article that appeared in Practical Sailor Magazine, August 15, 1994. The article has a photo of #139!! Click here to go to it. I saw something on my phone this morning, but was unable to determine how it got there or what picture you are referring to. 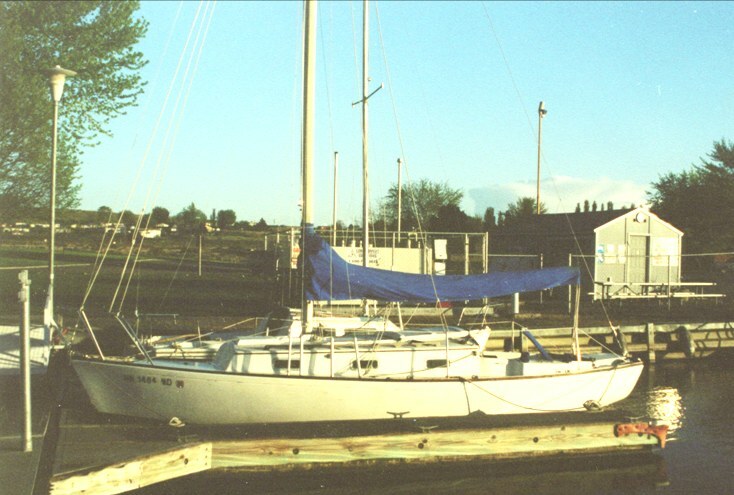 I still have the Dolphin, but it has been pretty much neglected lately as I have been cruising New England and the east coast on my Swan 40, Lucy Vincent, which is currently laid up in South Bristol, Maine. Last summer I made it to Mount Desert and I am hoping to get to Roque Island this summer. I have spent a lot of time in Camden and have sailed up Eggemoggin Reach a couple of times. Both times I thought I had gone to sailors heaven. I would love to meet up with you whether you are on your boat, or if you would like to come aboard as crew for a few days. I joined the Pelagic Sailing Club based in Boston and have been connecting with crew through them and have made some new friends that way. Since retiring four years ago, I also did a loop around the US on my motorcycle. Thanks for checking in with me. It’s good to hear from you. Acamar, hasn’t been commissioned for a few years while I have been sailing Lucy Vincent, my Swan 40, in New England. We did make it to Maine again last year and I saw that there were several Dolphins and another Swan 40 entered in an event in Camden (The Camden Classic Cup). I had hoped to possibly get up there but was on a club cruise and we didn’t make it that far. I sometimes think I should let Acamar have a new home but its hard to part with her after all these years. This picture was taken a year ago in July after I put six coats of varnish on the external teak. Postscript: It sounds like the Camden Cup was a fun event. I would have liked to have seen the other Dolphins and possibly another Swan 40. I may try and make it up there for next year. Just need to round up some crew. Lucy Vincent is at Pirate Cove Marina in Portsmouth RI for the second winter. The engine is currently out and I am ordering a remanufactured replacement. I was hoping to make it to the Bahamas this winter, but it seems like something always gets in the way. Last year it was flooding in my house, and the year before, medical stuff. Maybe next year. Thanks for the link to Marionette's 2018 log.